Faith Ringgold published her first children's book, Tar Beach, in 1991. This book has won numerous awards including Caldecott Honor and the Coretta Scott King Award for Best Illustration. Tar Beach was originally created as a story quilt, an art style she experimented with after her mother passed away in 1981. Her mother had taught her to sew and story quilting was seen by Ringgold as a tribute to everything her mother did for her. A story quilt combines painting, quilted fabric and storytelling. In Tar Beach, the cover art for the book was the center image on Ringgold's original story quilt. Ringgold writes words on her story quilts, as pages of the story, so that the viewer of the quilt could also relish in the story behind the art. Story quilting was initially successful for Ringgold as a struggling artist, because the painted quilts were more cost effective than taking large pieces as she traveled to art shows around the country. However, it is much different now as her artwork has been reportedly sold to many celebrities such as Oprah Winfrey, Michael Jordan and Denzel Washington. In my Faith Ringgold birthday post from 2007, I discussed a quick project I did with my 4th grade students after reading Tar Beach. I wanted to revisit the activity and improve upon it with my own children. In the story, Cassie Louise Lightfoot imagines herself flying over New York City. She imagines that a building can become her own if she flies over it. She flies over the George Washington Bridge, the Union Building that her father is not allowed to join because he is half-Black and half-Indian, and an ice cream factory. I had some old fabric that I wanted to have my children paint something they would like to fly over like Cassie. My daughter painted a princess castle and my son painted a robot. We let the paint dry and helped it along with a hair dryer. Later, when Mom came home from work she helped us sew our painting to some fabric which became a nice border. I did not have my children write any words on the fabric. 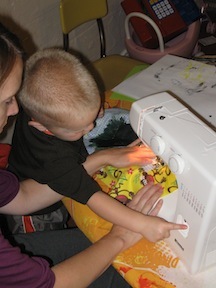 It was enough excitement to pin their painting to the fabric and assist with the sewing machine. Below is a Reading Rainbow episode that showcases the book Tar Beach. This would be great to watch if you decide to try Story Quilts in your home or classroom. Tar Beach from WVPT on Vimeo. Lastly, we did enjoy reading two books that were illustrated by Faith Ringgold. The first was the poetry book, Bronzeville Boys and Girls by Gwendolyn Brooks and The Three Witches collected by Zora Neale Harston and adapted by Joyce Carol Thomas. Three Witches is a bit creepy and we did not read it before bedtime, but it was fun to act out during the day. I asked my daughter if she wanted me to read it before bed and she shook her head "NO". The Three Witches have really long teeth and they chase the boy and girl up a tree. Luckily they are saved by their grandmother and their three dogs. The story is based upon an African American oral tale.